Among the worst-hit places was Bertie County, North Carolina, a rural area in the northeast part of the state. The weather service reported 14 deaths in the county. More than 50 people were taken to hospitals in Greenville, and between 50 and 70 homes were destroyed. North Carolina normally gets about 19 tornadoes a year, according to the National Climatic Data Center. There are 90 preliminary reports of tornadoes in the state in the latest storm system. The experts called it an "epic event". The storms were the latest in a round of severe weather that has hit parts of the Midwest and South since Thursday. They left a trail of downed trees and power lines, scattered cars and crushed homes as it moved east and then turned north. Emergency crews searched for victims Sunday in hard-hit swaths of North Carolina, where 62 tornadoes were reported the night before from the worst spring storm in two decades to hit the state. Eleven people were confirmed dead in Bertie County. Another four were confirmed dead in southeastern Bladen County, bringing the state's death toll to at least 21. NBC News was reporting at least 24 dead in North Carolina. In North Carolina, Gov. Beverly Perdue declared a state of emergency and said the 62 tornadoes reported were the most since March 1984, when a storm system spawned 22 twisters in the Carolinas that killed 57 people — 42 in North Carolina — and injured hundreds. Scenes of destruction across the South looked eerily similar in many areas. At one point, more than 250,000 people went without power in North Carolina before emergency utility crews began repairing downed lines. But scattered outages were expected to linger at least until Monday. Three ingredients were in place to allow this violent tornado outbreak to occur from the southern Plains to the Southeast: a powerful jet stream, abundant moisture and a strong cold front. A powerful jet stream helped to enhance the thunderstorm growth, while moisture surging in from the Gulf of Mexico acted as fuel for the thunderstorms. A strong cold front plowing across the South was the trigger that initiated the thunderstorm development. The difference in the direction of wind in the upper atmosphere, southwesterly, and the lower atmosphere, southerly to southeasterly, added a twisting motion that helped the severe thunderstorms to develop a rotation. Thus, the wind difference with height, referred to as wind shear by meteorologists, made the severe thunderstorms more likely to produce tornadoes. There are a couple of factors that are making this year a more active severe weather year compared to normal and compared to last year. The first factor is that the water in Gulf of Mexico is warmer than last year. This means that there is very warm, moist air in supply for storm systems to tap into and provide fuel for severe weather. The second is that we are in one of the strongest La Nina patterns in recorded history. This mid-April 2011 tornado outbreak is likely to rank among the largest tornado outbreaks in history with 241 tornado reports. There has not been a tornado outbreak in history over three days with this many tornadoes spawned by a single storm system. The notorious 1974 tornado outbreak, which occurred on April 3-4, 1974, produced 148 tornadoes over the course of two days and is thought of as one of the largest and deadliest tornado outbreak in history from one storm system. In the infamous May 2003 tornado outbreak sequence (May 4-10), 401 tornadoes occurred. However, multiple storm systems moving from the Southwest into the Plains triggered these tornadoes. 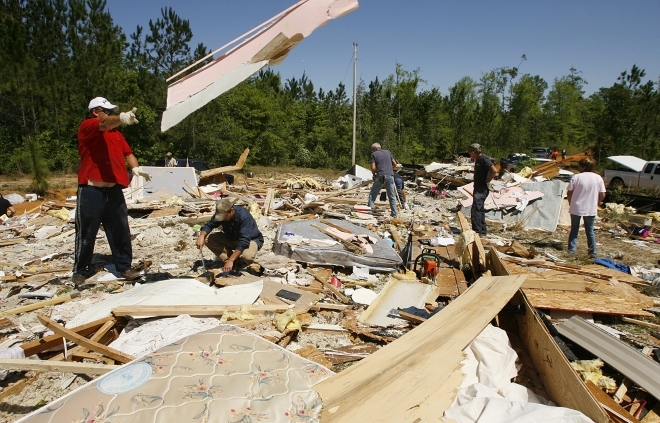 In 2004, there was a two-day tornado outbreak which produced 170 twisters. 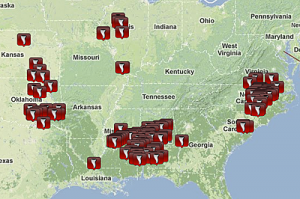 In the 2008 Super Tuesday tornado outbreak, there was 131 reported tornadoes in one day. At this stage, an exact comparison to historic outbreaks in terms of the strength and number of tornadoes cannot be made. It will take weeks for the tornado surveys, which determine the strength and exact number of tornadoes, to be conducted. We are not done yet, it's going to be a record tornado season!